After rescuing the Gypsies from the emperor’s destruction, the warrior farmers of Pravik have returned home. But peace is proving to be as dangerous as war. Book 3 of the The Seventh World Trilogy fantasy series by Rachel Starr Thomson. After rescuing the Gypsies from destruction at the hands of the emperor, the warrior farmers of Pravik have returned home to dwell above ground. But peace is proving to be as dangerous as war, as their food stores run out and they find themselves unable to go beyond the city to grow crops. Neighbouring towns, afraid of the rumours they’ve heard about Pravik, are unwilling to trade with them. When emissaries arrive from the emperor, inviting the Ploughman to form an alliance with him, he has no choice but to go. Along with Professor Huss, the Darkworld prince Harutek, and an unwilling Maggie, he rides for Athrom. But in doing so, he ignores the vision of the blind seer Virginia Ramsey, who has seen deadly consequences at the end of the Ploughman’s journey. Desperate for help from another source, Virginia sets out on a journey of her own, accompanied by the Darkworld priestess Rehtse – a journey to find the King and bring him to Pravik’s aid. Their parallel journeys will at last open the way to the worlds unseen, bringing in powers, terrors, beauties, and a final confrontation no one could imagine. Central to the fate of their world are the Gifted: the Singer, Seer, Healer, Listener, Warrior, and Voice. 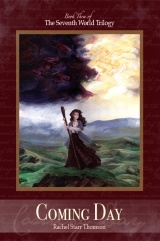 Book 3 of the The Seventh World Trilogy series, fantasy for all ages by Rachel Starr Thomson. I don’t think I’ve been this spiritually encouraged by a book in a long time. I felt that I turned a corner in the last few chapters, and found that the story which began in a strange land, a land vaguely similar to my own but the stuff of legend, had ended up all the way in my own room at 4 p.m.